Extra for the World Cup Update, EA SPORTS releases special Ultimate Team Cards for the participating nations. We present to you the currently best of the Spain Elf. On May 29, 2018, the free FIFA 18 update for the World Cup in Russia will be released. EA SPORTS brings four new game modes, all about the international football spectacle. For example, in the official » 2018 FIFA World Cup Russia « mode you can replay the 2018 World Cup as one of the 32 participating nations. There will also be a separate mode for FIFA Ultimate Team : The developer has released new maps of the national teams specifically for the FUT World Cup edition . 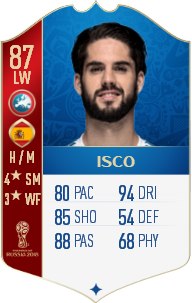 These are so-called dynamic cards, which are updated according to the performance of the players during the World Cup. As sofar, no one could negate CR7's ability, he is No.1 without any doult. Here ,We present you the best cards of the Spain national team.